Everyone wants to make safer products, but it’s very easy (and common) to make “regrettable substitutions.” In lots of cases companies preferentially pick chemicals with similar functional properties because there’s simply less known about them. Unfortunately there’s a good chance that the new chemical has hazards that are the same or worse than the one it’s replacing. That’s both regrettable and unnecessary. Comparisons are important not just to see relative hazard profiles but also data gaps. This post will show you how to make comparisons and share them so your whole company and supply chain can get on the same page and find real preferred alternatives. Most comparisons start with a baseline substance; this may be what you use today or what most people in your industry are using. Add a List Name. This will help you share your comparison or find it later. Search for new chemicals to add to your comparison. Below, we add Bisphenol F to the comparison. 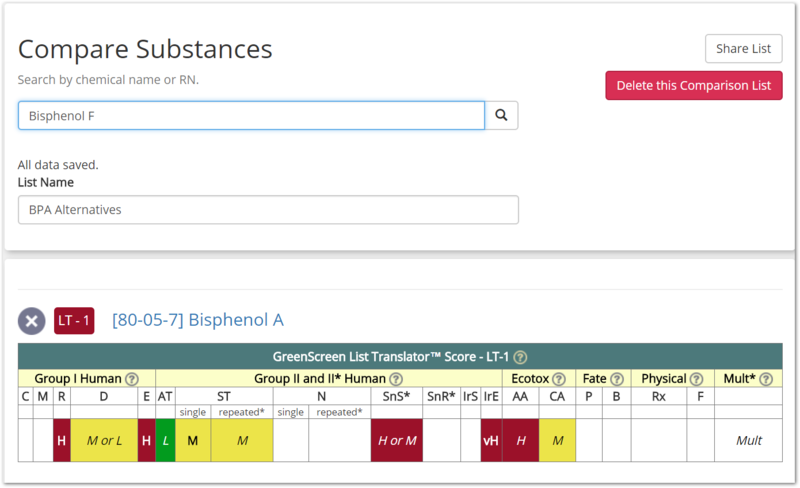 When you search for Bisphenol F, you're taken to search results again - this time when you click Add to Comparison, choose your existing comparison! Within your new comparison, you can see substance chemical hazards side-by-side. 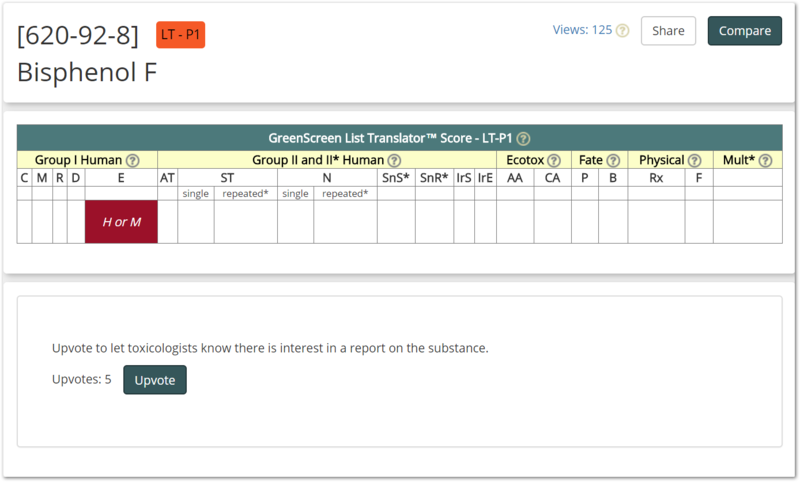 The LT-P1 designation (Possible Chemical of High Concern) informs us that more information is probably needed before a substitution can proceed. Let's say you're aiming for your product to be BPA-free, but you're considering using BPF as a substitution. Sharing your comparison will show data gaps to colleagues and explain why you should perform a hazard assessment before proceeding - in this case BPF isn't necessarily better, it's just unknown, and future analysis of BPF could set you back if it turns out to be as bad or worse than BPA. Your list can be shared with anyone, anywhere, and in whichever format you choose. 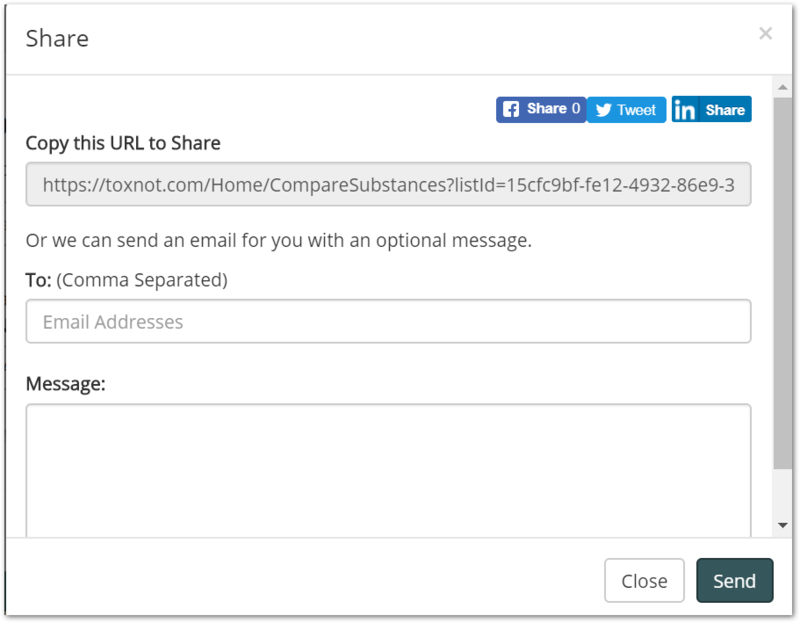 You're sharing access to Toxnot's free public information, so send it to anyone in your company or supply chain. Upvoted projects may be taken on by a toxicologist, starting a crowdfunding event to raise money to cover the cost of analysis. 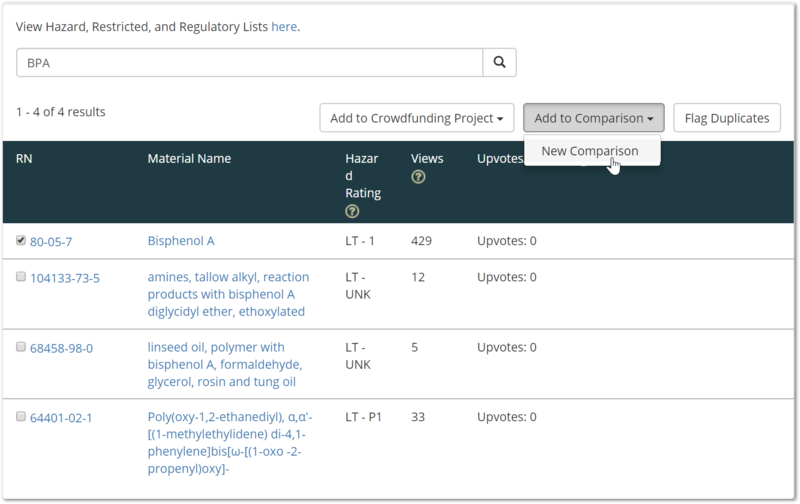 Projects in progress will have a Fund button where you can contribute to the cost of analysis. You can find your comparisons at any time by going to Design Tools and selecting Substance Comparisons.